As a pulsating metal kerrang bashes out your speakers a voice roars above it like Dio and then opts for the high scream of Rob Halford; while the chorus melody harkens all the way back to Judas Priest’s own ‘Starbreaker’. 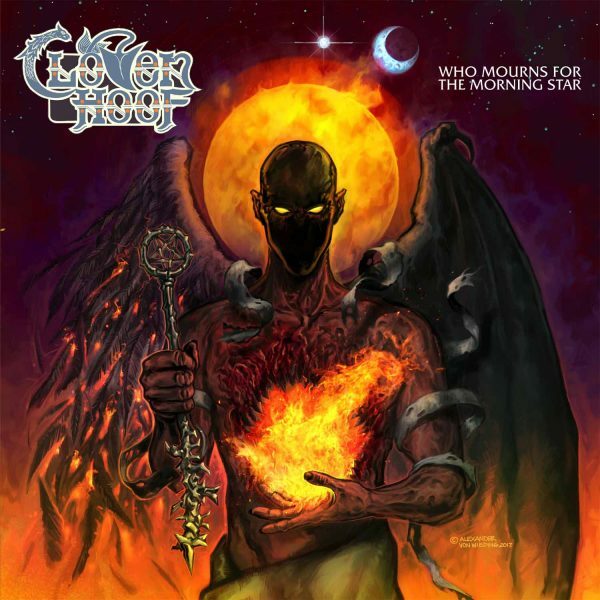 That it’s the opening gambit of Midlands metal merchants Cloven Hoof’s first album in a few years with their own ‘Star Rider’ could have been a misstep but the song moves beyond its source material with guitars racing wildly about before finding purpose in solo. Surfacing out of the heady mists of the Black Country during the 80s, Cloven Hoof made a number of albums before calling it a day the following decade. With the European festival circuit now established and looking for acts with a certain niche market value, the Hoof reformed, and as with many such resurrections, the line-up looked rather different. Now, with only bass player and main songwriter Lee Payne from the original line up, a twin-pronged guitar attack in the form of Chris Coss and Luke Hatton, plus new drummer Danny White and singer George Call (both previously of US act Aska), they’ve released Who Mourns For The Morning Star through German label High Roller Records. If you like your heavy metal in the Priest, Maiden and Helloween power-driven vein, step right up and hand over your money. While double bass drum twacking and guitar widdling gymnastics aren’t my cup of tea, for the most part they’re put into good service here with the album offering variety within its remit, a large part of that down to Call and the songs themselves, though the lyrics do veer from the rather cheesy devil-worshipping to more impressive roads-less-travelled narratives. Thematically, Cloven Hoof take Milton’s Paradise Lost overview of his dark satanic majesty, alongside popular culture’s fantasy and science fiction tropes… But don’t worry; it continues to belt out loud. ‘Song of Orpheus’ differs slightly however being a broken-chorded guitar affair over a pounding groove; striking a fine balance between its lighter an heavier moments with a hook line chorus. Later ‘Neon Angels’ will similarly prove a big rocking slightly AOR chorded number that bites with an affecting voice while twin harmony guitars peel off notes. Elsewhere we return to a thrashing charge offset by vocal harmonies, a splintered guitar riff and some melodrama on ‘I Talk To The Dead’. ‘Time To Burn’ is aptly titled wearing its Blackmore influences with a speedy Purple-sized riff here and phased drumming ala by Rainbow’s ‘Tarot Woman’. There’s melody in the rage, it’s gloriously big and clichéd, heavy metal writ large. Worldwide political madness is espoused on ‘Mindmaster’, a raging staccato riff before the guitars swarming like hornets round a nest… Or possibly around Call as his multi-layered scream fades out, descending down into the pits of hell. ‘Morning Star’ itself screams with metallic blues notes delineated Schenker style before an acoustic and synthesised ballad ensues between some intricate guitar patterns that then gallop off before merging in harmony. It’s not the album’s epic however, that status is reserved for its final two tracks. ‘Go Tell The Spartans’ is history wrapped in myth, grabbing your attention as it builds into bloodied battle mode with cutting guitars chords and fluid screaming licks. Longer still is ‘Bannockburn’: electric guitars feign old world pageantry, then pastoral keyboard and piano with a 60s pop-psychedelic flavour mislead as we’re ambushed by a Maiden-style attack from all and sundry. At over seven minutes this needs to go somewhere and the guitars swarm earnestly, there are also vintage Jailbreak-era Lizzy harmonies before slowing to a crawl, drumming dropping to a military beat before events return savagely before concluding in heroically tragic defeat. While greater aural separation would benefit the nuances of certain numbers, overall the songs stand up well, collectively giving the impression Cloven Hoof made the right decision reforming.